The Canon PowerShot G1 X was one of the most interesting things to come out of CES 2012. It is, according to Canon, the finest compact camera it has ever made, and it features a sensor that is almost as big as those found in its DSLRs. It seems that the natural competitor for the Canon PowerShot G1 X is last year's Fuji FinePix X100 - a retro-styled, high-end compact camera that has found a market with enthusiast photographers looking for a good back-up to their DSLR. But how do these two premium compact cameras compare? Although both cameras feature large sensors compared to their small body size, it is of course the Fujifilm FinePix X100 that wins here in the technical stakes, thanks to its APS-C sized CMOS sensor. However, while the Canon PowerShot G1 X's physical size is smaller, it does boast an extra 2MP and the same pixel size as its DSLR stablemate, the Canon EOS 600D. Determining the best differences between the lenses on these cameras depends on what you're looking for. While some people won't like the fact that the Fuji FinePix X100 only has one focal length - 23mm (35mm in equivalent terms) - others will inevitably see that as part of its charm. And of course it also comes with a wide maximum aperture of f/2.0. That said, it's hard to deny the flexibility that a zoom lens such as the Canon PowerShot G1 X's 4x optical zoom provides, giving it an effective focal length of 28-112mm. At its lens's widest end, the Canon PowerShot G1 X's widest aperture is f/2.8, potentially giving the Fuji the edge in low-light stakes. Going hand-in-hand with the wide aperture lens is the camera's ISO sensitivity range. Both cameras are capable of reaching ISO 12,800, which is a first for a Canon compact camera. In our review, we found that the Fuji FinePix X100's noise reduction options do a good job of processing out noise from high-sensitivity shots, while we found slight banding issues at the highest end of the spectrum. We're looking forward to seeing how the Canon PowerShot G1 X compares when we test it for our full review, although the inclusion of Canon's new Digic 5 processor is a promising start, since we've found it performs very well in other cameras that use it, including the Canon PowerShot S100 and the PowerShot SX40. In the past, we've been disappointed by the quality of the viewfinder on Canon's G series of compact cameras. But the Canon PowerShot G1 X's is a bit better, because it's bigger and more practical. Meanwhile, the Fuji FinePix X100's hybrid viewfinder (it has both an optical and an electronic finder) has generally been highly praised. Again, we're looking forward to putting the Canon PowerShot G1 X's viewfinder to the full test when it comes in for our full review. Both the cameras have the capability to shoot HD video. But the Canon PowerShot G1 X has the edge, since it produces full 1080p footage, compared with the Fuji FinePix X100's 720p movies. Both are capable of shooting at 24fps. There are again pros and cons for each camera's LCD screens. Both are 2.8-inch units, but the Canon PowerShot G1 X's is on an articulating hinge. This proves extremely handy for shooting in awkward positions, and is great for shooting video. But, on the other hand, it reduces the sleekness of the camera, creating bulk and potential weak points in the camera's body. There is no denying that vintage is very much in vogue right now. Fujifilm has clearly gone down the retro route with the FinePix X100, and this seems to be one of its key selling points. The company has continued the styling with other X range cameras, including the Fuji FinePix X10 compact camera and the new Fuji X Pro-1 compact system camera. The Canon PowerShot G1 X, on the other hand, has a much more utilitarian appearance, with bulky modules and a wide body. Sadly, we can't see anybody giving any style awards to the Canon camera's body, so the Fuji definitely wins out in the looks department. Well it's a toughie, no doubt about that. It's difficult coming to a firm conclusion when we are yet to fully test the Canon PowerShot G1 X, and both cameras have extremely strong selling points. In the end it probably comes down to a head vs heart decision. We think the Fuji FinePix X100 with its beautiful aesthetics and slightly larger sensor just about edges it for the heart the moment, but the versatility of the Canon PowerShot G1 X is perhaps the choice of our heads. 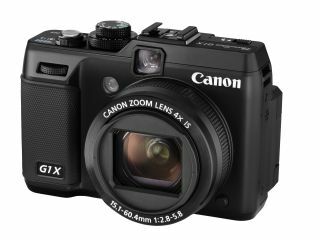 We will of course bring you a full in-depth review of the Canon PowerShot G1 X as soon as possible, at which time our minds may be changed. Watch this space.